Just so we’re all clear, Pendragon was born in the century that only recently passed as John Timothy Rothwell but later changed his name to Excalibur. 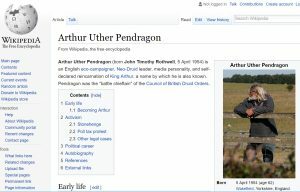 According to Wikipedia, in 1991, he was named Pendragon and Swordbearer to the Glastonbury Order of Druids. It turns out that the self-proclaimed reincarnation of King Arthur is a bit of a crusader (sorry, couldn’t resist) and no stranger to the English courts. Back to the case. Parking for the riff raff at Stonehenge usually costs £5. However, Pendragon was charged (but didn’t pay) £15 during the 2016 summer solstice prayer ceremony that he was attending, which is part of the Druid religion. Apparently, English Heritage increased the parking fee in an effort to encourage more people to car share or travel by bus. I can’t quite imagine a bus full of Druids. Motorbikes yes, Bluebird buses, not so much. English Heritage’s (EH) side of the story, according to a statement they issued earlier, is: “In recent years there has been a huge growth in people and cars coming to the World Heritage Site to celebrate the Summer Solstice. In 2000, approximately 10,000 people attended the Solstice celebrations, while in 2014, the figure was close to 40,000.” That’s a lot of people, Pagan or otherwise. Pendragon doesn’t agree with the parking fee, stating that he wanted to prove EH was wrong to turn him away when he refused to “pay to pray”, the BBC reports. And he wasn’t the only one who refused to pay. Pendragon has a lot of support in this case: he was joined by other Druid, Heathen and Wiccan supporters to protest outside the court. Reportedly, something like 12,500 people take part in this annual ceremony and a lot of them feel that the parking fee was “exclusionary”. Pendragon claims that the fine “unfairly targets his religion,” and breached his human rights. For those of you not in the loop on Druid religious holidays, there are four annual dawn ceremonies at Stonehenge—those parking fees could add up. So off to court they go—Salisbury small claims court that is. The court will set a full day of hearings which Pendragon has requested not interfere with the spring or summer solstice. Maybe they should be praying for free parking, as they’re obviously not taking the bus. Then again, what about horseback? This was posted on Tuesday, January 10th, 2017 at 5:40 pm and is filed under Crazy Sh*t Lawyers See, Discrimination . Feel free to respond, or trackback. Read our comments policy.